Animaniacs is an American animated comedy television series created by Tom Ruegger. It is the second animated series produced by Amblin Entertainment in association with Warner Bros. Animation. The show first aired on the Fox Network as part of its Fox Kids block from 1993 to 1995 before moving to The WB in 1995 until the series ended in 1998 as part of its Kids' WB afternoon programming block. It initially ran a total of 99 episodes and one film, Wakko's Wish. The Warner siblings live in the water tower on the Warner Bros. studio lot in Burbank, California. However, characters from the series had episodes in various places and periods of time. The Animaniacs characters interacted with famous people and creators of the past and present as well as mythological characters and characters from contemporary pop culture and television. Andrea Romano, the casting and recording director of Animaniacs, said that the Warner siblings functioned to "tie the show together," by appearing in and introducing other characters' segments. Each Animaniacs episode usually consisted of two or three cartoon shorts. Animaniacs segments ranged in time, from bridging segments less than a minute long to episodes spanning the entire show length; writer Peter Hastings said that the varying episode lengths gave the show a "sketch comedy" atmosphere. Animaniacs had a wide cast of characters. Shown here are the majority of the characters from the series. Animaniacs had a large cast of characters, separated into individual segments, with each pair or set of characters acting in its own plot. The Warner kids, Yakko, Wakko, and Dot, were three cartoon stars from the 1930s that were locked away in the Warner Bros. Water Tower until the 1990s, when they escaped. After their escape, they often interacted with Warner Bros. studio workers, including Ralph the Security Guard; Dr. Otto Scratchansniff, the studio psychiatrist, and his assistant Hello Nurse. Pinky and the Brain are two genetically altered laboratory mice who continuously plot and attempt to take over the world. Slappy Squirrel is an octogenarian cartoon star who can easily outwit antagonists and uses her wiles to educate her nephew, Skippy Squirrel, about cartoon techniques. Additional principal characters included Rita and Runt, Buttons and Mindy, Chicken Boo, Flavio and Marita (The Hip Hippos), Katie Ka-Boom, and a trio of pigeons known as The Goodfeathers. The Animaniacs cast of characters had a variety of inspiration, from celebrities to writers' family members to other writers. Executive producer Steven Spielberg said that the irreverence in Looney Tunes cartoons inspired the Animaniacs cast. Tom Ruegger created Pinky and the Brain, a series Sherri Stoner had also written for, after being inspired by the personalities of two of his Tiny Toon Adventures colleagues, Eddie Fitzgerald and Tom Minton. Ruegger thought of the premise for Pinky and the Brain when wondering what would happen if Minton and Fitzgerald tried to take over the world. Deanna Oliver contributed The Goodfeathers scripts and the character Chicken Boo, while Nicholas Hollander based Katie Kaboom on his teenage daughter. Ruegger modeled the Warners' personalities heavily after his three sons. Because the Warners were portrayed as cartoon stars from the early 1930s, Ruegger and other artists for Animaniacs made the images of the Warners similar to cartoon characters of the early 1930s. Simple black and white drawings were very common in cartoons of the 1920s and 1930s, such as Buddy, Felix the Cat, Oswald the Lucky Rabbit, and the early versions of Mickey Mouse and Minnie Mouse. Sherri Stoner created Slappy the Squirrel when another writer and friend of Stoner, John McCann, made fun of Stoner's career in TV movies playing troubled teenagers. When McCann joked that Sherri would be playing troubled teenagers when she was fifty years old, the latter developed the idea of Slappy's characteristics as an older person acting like a teenager. Stoner liked the idea of an aged cartoon character because an aged cartoon star would know the secrets of other cartoons and "have the dirt on [them]". Steven Spielberg served as executive producer, under his Amblin Television label. Showrunner and senior producer Tom Ruegger lead the overall production and writer's room. Producers Peter Hastings, Sherri Stoner, Rusty Mills, and Rich Arons contributed scripts for many of the episodes and had an active role during group discussions in the writer's room as well. The writers and animators of Animaniacs used the experience gained from the previous series to create new animated characters that were cast in the mold of Chuck Jones and Tex Avery's creations. Additional writers for the series included Liz Holzman, Paul Rugg, Deanna Oliver, John McCann, Nicholas Hollander, Charlie Howell, Gordon Bressack, Jeff Kwitny, Earl Kress, Tom Minton, and Randy Rogel. Hastings, Rugg, Stoner, McCann, Howell, and Bressack were involved in writing sketch comedy while others, including Kress, Minton, and Rogel, came from cartoon backgrounds. Made-up stories did not exclusively comprise Animaniacs writing, as Hastings remarked: "We weren't really there to tell compelling stories ... [As a writer] you could do a real story, you could recite the Star-Spangled Banner, or you could parody a commercial ... you could do all these kinds of things, and we had this tremendous freedom and a talent to back it up." Writers for the series wrote into Animaniacs stories that happened to them; the episodes "Ups and Downs," "Survey Ladies," and "I Got Yer Can" were episodes based on true stories that happened to Rugg, Deanna Oliver, and Stoner, respectively. Another episode, "Bumbie's Mom," both parodied the film Bambi and was a story based on Stoner's childhood reaction to the film. In an interview, the writers explained how Animaniacs allowed for non-restrictive and open writing. Hastings said that the format of the series had the atmosphere of a sketch comedy show because Animaniacs segments could widely vary in both time and subject, while Stoner described how the Animaniacs writing staff worked well as a team in that writers could consult other writers on how to write or finish a story, as was the case in the episode "The Three Muska-Warners". Rugg, Hastings and Stoner also mentioned how the Animaniacs writing was free in that the writers were allowed to write about parody subjects that would not be touched on other series. Animaniacs featured Rob Paulsen as Yakko, Pinky and Dr. Otto von Scratchansniff, Tress MacNeille as Dot, Jess Harnell as Wakko, Sherri Stoner as Slappy the Squirrel, Maurice LaMarche as the Brain, Squit and the belching segments "The Great Wakkorotti" (Harnell said that he himself is commonly mistaken for the role), and veteran voice actor Frank Welker as Ralph the Security Guard, Thaddeus Plotz and Runt. Andrea Romano said that the casters wanted Paulsen to play the role of Yakko: "We had worked with Rob Paulsen before on a couple of other series and we wanted him to play Yakko." Romano said that the casters had "no trouble" choosing the role of Dot, referring to MacNeille as "just hilarious ... And yet [she had] that edge." Before Animaniacs, Harnell had little experience in voice acting other than minor roles for Disney which he "fell into". Harnell revealed that at the audition for the show, he did a John Lennon impression and the audition "went great". Stoner commented that when she gave an impression of what the voice would be to Spielberg, he said she should play Slappy. According to Romano, she personally chose Bernadette Peters to play Rita. Other voices were provided by Jim Cummings, Paul Rugg, Vernee Watson-Johnson, Jeff Bennett and Gail Matthius. Tom Ruegger's three sons also played roles on the series. Nathan Ruegger voiced Skippy Squirrel, nephew to Slappy, throughout the duration of the series; Luke Ruegger voiced The Flame in historical segments on Animaniacs; and Cody Ruegger voiced Birdie from Wild Blue Yonder. Animation work on Animaniacs was farmed out to several different studios, both American and international, over the course of the show's production. The animation companies included Tokyo Movie Shinsha (now known as TMS Entertainment), StarToons, Wang Film Productions, Freelance Animators New Zealand, and AKOM, and most Animaniacs episodes frequently had animation from different companies in each episode's respective segments. Animaniacs was made with a higher production value than standard television animation; the show had a higher cel count than most TV cartoons. The Animaniacs characters often move fluidly, and do not regularly stand still and speak, as in other television cartoons. Animaniacs utilized a heavy musical score for an animated program, with every episode featuring at least one original score. The idea for an original musical score in every episode came from Steven Spielberg. Animaniacs used a 35-piece orchestra,[a] and seven composers were contracted to write original underscore for the series run: Richard Stone, Steve Bernstein, Julie Bernstein, Carl Johnson, J. Eric Schmidt, Gordon Goodwin, and Tim Kelly. The use of the large orchestra in modern Warner Bros. animation began with Animaniacs predecessor, Tiny Toon Adventures, but Spielberg pushed for its use even more in Animaniacs. Although the outcome was a very expensive show to produce, "the sound sets us apart from everyone else in animation," said Jean MacCurdy, the executive in charge of production for the series. According to Steve and Julie Bernstein, not only was the Animaniacs music written in the same style as that of Looney Tunes composer Carl Stalling, but that the music was recorded at the Eastwood Scoring Stage, which was used by Stalling as well as its piano. Senior producer Tom Ruegger said that writers Randy Rogel, Nicholas Hollander, and Deanna Oliver wrote "a lot of music" for the series. The humor of Animaniacs varied in type, ranging from parody to cartoon violence. The series made parodies of television shows and films. In an interview, Spielberg defended the "irreverence" of Animaniacs, saying that the Animaniacs crew has "a point of view" and does not "sit back passively and play both sides equally". Spielberg also said that Animaniacs' humor of social commentary and irreverence were inspired by the Marx Brothers and Looney Tunes cartoons. Animaniacs, among other Spielberg-produced shows, had a large amount of cartoon violence. Spielberg defended the violence in Animaniacs by saying that the series had a balance of both violent humor and educational segments, so the series would never become either too violent or "benign". Animaniacs also made use of catchphrases, recurring jokes and segments, and "adult" humor. Characters on Animaniacs had catchphrases, with some characters having more than one. Notable catchphrases include Yakko's "Goodnight, everybody!" often said following adult humor, Wakko's "Faboo!" and Dot's frequent assertions of her cuteness. The most prominent catchphrase that was said by all three Warners was "Hello-o-o, nurse!" Tom Ruegger said that the "Hello-o-o, Nurse!" line was intended to be a catchphrase much like Bugs Bunny's line, "What's up, doc?" Before the theme song for each "Pinky and the Brain" segment, Pinky asks, "Gee, Brain, what do you want to do tonight?" Brain replies, "The same thing we do every night, Pinky: try to take over the world!" During these episodes, Brain often asks Pinky, "Are you pondering what I'm pondering?" and Pinky replies with a silly non sequitur that changes every episode. Writer Peter Hastings said that he unintentionally created these catchphrases when he wrote the episode "Win Big," and then Producer Sherri Stoner used them and had them put into later episodes. Running gags and recurring segments were very common in the show. The closing credits for each episode always included one joke credit and ended with a water tower gag similar to The Simpsons couch gag. Director Rusty Mills and senior producer Tom Ruegger said that recurring segments like the water tower gag and another segment titled "The Wheel of Morality" (which, in Yakko's words, "adds boring educational value to what would otherwise be an almost entirely entertaining program", and ends with a "moral" that makes no sense) eased the production of episodes because the same animated scenes could be used more than once (and, in the case of the Wheel segments, enabled the producers to add a segment in where there was not room for anything else in the episode). A great deal of Animaniacs' humor and content was aimed at an adult audience. Animaniacs parodied the film A Hard Day's Night and the Three Tenors, references that The New York Times wrote were "appealing to older audiences". The comic operas of Gilbert and Sullivan Pirates of Penzance and H.M.S. Pinafore were parodied in episode 3, "HMS Yakko". The Warners' personalities were made similar to those of the Marx Brothers and Jerry Lewis, in that they, according to writer Peter Hastings, "wreak havoc," in "serious situations". In addition, the show's recurring Goodfeathers segment was populated with characters based on characters from The Godfather and Goodfellas, R-rated crime dramas neither marketed nor intended for children. Some content of Animaniacs was not only aimed at an adult audience but was suggestive in nature; one character, Minerva Mink, had episodes that network censors considered too sexually suggestive for the show's intended audience, for which she was soon de-emphasized as a featured character. Jokes involving such innuendo would often end with Yakko telling "Goodnight, everybody!" as a punchline. Parodies and caricatures made up a large part of Animaniacs. The episode "Hello, Nice Warners" introduced a Jerry Lewis caricature (left), who made occasional appearances in the series and movie. Animaniacs parodied popular TV shows and movies and caricatured celebrities. Animaniacs made fun of celebrities, major motion pictures, television shows for adults (Seinfeld and Friends, among others), television shows for children, and trends in the US. One episode even made fun of competing show Power Rangers, and another episode caricatured Animaniacs' own Internet fans. Animaniacs also made potshots of Disney films, creating parodies of such films as The Lion King, Beauty and the Beast, Pocahontas, Bambi, and others. Animaniacs director Russell Calabrese said that not only did it become a compliment to be parodied on Animaniacs but also that being parodied on the series would be taken as a "badge of honor". Animaniacs had a variety of music types. Many Animaniacs songs were parodies of classical or folk music with educational lyrics. Notable ones include "Yakko's World", in which Yakko sings the names of all 200-some nations of the world to the tune of the "Mexican Hat Dance". "Wakko's America" listed all the United States and their capitals to the tune of "Turkey in the Straw". Another song, titled "The Presidents", named every US president at the time to the tune of the "William Tell Overture" (with brief snippets of the tunes "Mademoiselle from Armentieres" and "Dixie"). Non-educational songs included parodies such as the segment "Slippin' on the Ice" and a parody of "Singin' in the Rain". Most of the groups of characters even had their own theme songs for their segment on the show. The Animaniacs series theme song, performed by the Warners, was a very important part of the show. In the series' first season, the theme won an Emmy Award for best song. Ruegger wrote the lyrics, and Stone composed the music for the title sequence. Several Animaniacs albums and sing-along VHS tapes were released, including the CDs Animaniacs, Yakko's World, and Variety Pack, and the tapes Animaniacs Sing-Along: Yakko's World and Animaniacs Sing-Along: Mostly in Toon. Shorts featuring Rita and Runt would also incorporate songs for Bernadette Peters to sing. Animaniacs was a successful show, gathering both child and adult fans. The series received ratings higher than its competitors and won eight Daytime Emmy Awards and one Peabody Award. During its run, Animaniacs became the second-most popular children's show in both demographics of children ages 2–11 and children ages 6–11 (behind Mighty Morphin Power Rangers). Animaniacs, along with other animated series, helped to bring "Fox Kids" ratings much larger than those of the channel's competitors. In November 1993, Animaniacs and Tiny Toon Adventures almost doubled the ratings of their rival shows, Darkwing Duck and Goof Troop, in both the 2–11 and 6–11 demographics that are very important to children's networks. On Kids' WB, Animaniacs gathered about one-million children viewers every week. While Animaniacs was popular among younger viewers (the target demographic for Warner Bros.' TV cartoons), adults also responded positively to the show; in 1995, more than one-fifth of the weekday (4 p.m., Monday through Friday) and Saturday morning (8 a.m.) audience viewers were 25 years or older. The large adult fanbase even led to one of the first Internet-based fandom cultures. During the show's prime, the Internet newsgroup alt.tv.animaniacs was an active gathering place for fans of the show (most of whom were adults) to post reference guides, fan fiction, and fan-made artwork about Animaniacs. The online popularity of the show did not go unnoticed by the show's producers, and twenty of the most active participants on the newsgroup were invited to the Warner Bros. Animation studios for a gathering in August 1995 dubbed by those fans Animania IV. Animaniacs' first major award came in 1993, when the series won a Peabody Award in its debuting season. In 1994, Animaniacs was nominated for two Annie Awards, one for "Best Animated Television Program", and the other for "Best Achievement for Voice Acting" (Frank Welker). Animaniacs also won two Daytime Emmy Awards for "Outstanding Achievement in Music Direction and Composition" and "Outstanding Original Song" (Animaniacs Main Title Theme). In 1995, Animaniacs was nominated four times for the Annie Awards, once for "Best Animated Television Program", twice for "Voice Acting in the Field of Animation" (Tress MacNeille and Rob Paulsen), and once for "Best Individual Achievement for Music in the Field of Animation" (Richard Stone). In 1996, Animaniacs won two Daytime Emmy Awards, one for "Outstanding Animated Children's Program" and the other for "Outstanding Achievement in Animation". In 1997, Animaniacs was nominated for an Annie Award for "Best Individual Achievement: Directing in a TV Production" (Charles Visser for the episode "Noel"). Animaniacs also won two more Daytime Emmy Awards, one for "Outstanding Animated Children's Program" and the other for "Outstanding Music Direction and Composition". In 1998, the last year in which new episodes of Animaniacs were produced, Animaniacs was nominated for an Annie Award in "Outstanding Achievement in an Animated Daytime Television Program". Animaniacs also won a Daytime Emmy Award in "Outstanding Music Direction and Composition" (for the episode "The Brain's Apprentice"). In 1999, Animaniacs won a Daytime Emmy Award for "Outstanding Achievement in Music Direction and Composition". When Animaniacs won this award, it set a record for most Daytime Emmy Awards in the field of "Outstanding Achievement in Music Direction and Composition" for any individual animation studio. In 2009, IGN named Animaniacs the 17th-best animated television series. On September 24, 2013, Animaniacs was listed among TV Guide's "60 Greatest TV Cartoons of All Time". The Warner siblings as ducks, before they were changed to their dog-like species. The idea for the Warners to be ducks was changed during preproduction of the series. Before Animaniacs was put into production in 1991, various collaboration and brainstorming efforts were thought up to create both the characters and premise of the series. For instance, ideas that were thrown out were Rita and Runt being the hosts of the show and the Warners being duck characters that senior producer Tom Ruegger drew in his college years. After the characters from the series were created, they were all shown to executive producer Steven Spielberg, who would decide which characters would make it into Animaniacs (the characters Buttons and Mindy were chosen by Spielberg's daughter). The characters' designs came from various sources, including caricatures of other writers, designs based on early cartoon characters, and characters that simply had a more modern design. Animaniacs premiered on September 13, 1993, on the Fox Kids programming block of the Fox network, and ran there until September 8, 1995; new episodes aired from the 1993 through 1994 seasons. Animaniacs aired with a 65-episode first season because these episodes were ordered by Fox all at once. While on Fox Kids, Animaniacs gained fame for its name and became the second-most popular show among children ages 2–11 and children ages 6–11, second to Mighty Morphin Power Rangers (which began that same year). On March 30, 1994, Yakko, Wakko, and Dot first theatrically appeared in the animated short, "I'm Mad", which opened nationwide alongside the full-length animated feature, Thumbelina. The musical short featured Yakko, Wakko, and Dot bickering during a car trip. Producers Steven Spielberg, Tom Ruegger, and Jean MacCurdy wanted "I'm Mad" to be the first of a series of shorts to bring Animaniacs to a wider audience. However, "I'm Mad" was the only Animaniacs theatrical short produced. The short was later incorporated into Animaniacs episode 69. Following the 65th episode of the series, Animaniacs continued to air in reruns on Fox Kids. The only new episodes during this time included a short, four-episode long second season that was quickly put together from unused scripts. After Fox Kids aired Animaniacs reruns for a year, the series switched to the new Warner Bros. children's programming block, Kids' WB. The series was popular enough for Warner Bros. Animation to invest in additional episodes of Animaniacs past the traditional 65-episode marker for syndication. Animaniacs premiered on the new Kids' WB line-up on September 9, 1995, with a new season of 13 episodes. At this time, the show's popular cartoon characters, Pinky and the Brain, were spun off from Animaniacs into their own TV series. Warner Bros. stated in a press release that Animaniacs gathered over one million children viewers every week. Despite the series' success on Fox Kids, Animaniacs on Kids' WB was only successful in an unintended way, bringing in adult viewers and viewers outside the Kids' WB target demographic of young children. This unintended result of adult viewers and not enough young viewers put pressure on the WB network from advertisers and caused dissatisfaction from the WB network towards Animaniacs. Slowly, orders from the WB for more Animaniacs episodes dwindled and Animaniacs had a couple more short seasons, relying on leftover scripts and storyboards. 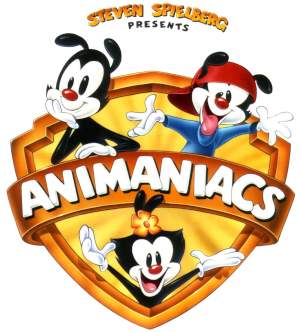 The fourth season had eight episodes, which was reduced from 18 because of Warner Bros.' dissatisfaction with Animaniacs. The 99th and final Animaniacs episode aired on November 14, 1998. The Chicago Tribune reported in 1999 that the production of new Animaniacs episodes ceased and the direct-to-video film Wakko's Wish was a closer to the series. Animation World Network reported that Warner Bros. laid off over 100 artists, contributing to the reduced production of the original series. Producer Tom Ruegger explained that rather than produce new episodes, Warner Bros. instead decided to use the back-catalog of Animaniacs episodes until "someone clamors for more." Animaniacs segments were shown along with segments from other cartoons as part of The Cat&Birdy Warneroonie PinkyBrainy Big Cartoonie Show. Ruegger said at the time the hiatus was "temporary". Following the end of the series, the Animaniacs team developed Wakko's Wish. On December 21, 1999, Warner Bros. released Wakko's Wish. In 2016, Ruegger said on his Reddit AMA that the decline of Animaniacs and other series was the result of Warner Bros.' investment in the much cheaper anime series Pokémon. Following Warner Bros. right to distribute the cheaper and successful anime, the network chose to invest less in original programming like Animaniacs. After Animaniacs, Spielberg collaborated with Warner Bros. Animation again to produce the short-lived series Steven Spielberg Presents Freakazoid, along with the Animaniacs spin-off series Pinky and the Brain, from which Pinky, Elmyra & the Brain was later spun off. Warner Bros. also produced two other comedy animated series in the later half of the decade titled Histeria! and Detention, which were short-lived and unsuccessful compared to the earlier series. Later, Warner Bros. cut back the size of its animation studio because the show Histeria! went over its budget, and most production on further Warner Bros. animated comedy series ceased. Animaniacs, along with Tiny Toon Adventures, continued to rerun in syndication through the 1990s into the early 2000s after production of new episodes ceased. In the US, Animaniacs aired on Cartoon Network, originally as a one-off airing on January 31, 1997, and then on the regular schedule from August 31, 1998 until the spring of 2001, when Nickelodeon bought the rights to air the series beginning on September 1, 2001. Nickelodeon transferred the series to its newly launched sister channel Nicktoons on May 1, 2002, and aired there until July 7, 2005. Animaniacs aired on Hub Network from January 7, 2013 until October 10, 2014. Since 2016, Paulsen, Harnell, and MacNeille have toured as Animaniacs Live!, performing songs from Animaniacs! along with a full orchestra. Among the songs will be an updated version of "Yakko's World" by Randy Rogel that includes a new verse to include nations that have been formed since the song's original airing, such as those from the break-up of the Soviet Union. The Warners starred in the feature-length, direct-to-video movie Wakko's Wish. The movie takes place in the fictional town of Acme Falls, in which the Warners and the rest of the Animaniacs cast are under the rule of a greedy king who conquered their home country from a neighboring country. When the Warners find out about a star that will grant a wish to the first person that touches it, the Warners, the villagers (the Animaniacs cast), and the king race to get to it first. Although children and adults rated Wakko's Wish highly in test-screenings, Warner Bros. decided to release it direct-to-video, rather than spend money on advertising. Warner Bros. released the movie on VHS on December 21, 1999; the film was then released on DVD on October 7, 2014. Episodes of the show have been released on DVD and VHS during and after the series run. VHS tapes of Animaniacs were released in the United States and in the United Kingdom. All of these tapes are out of production, but are still available at online sellers. The episodes featured are jumbled at random and are in no particular order with the series. Each video featured four to five episodes each and accompanied by a handful of shorter skits, with a running time of about 45 minutes. Beginning on July 25, 2006, Warner Home Video began releasing DVD volume sets of Animaniacs episodes in order of the episodes' original airdates. Volume one of Animaniacs sold very well; over half of the product being sold in the first week made it one of the fastest selling animation DVD sets that Warner Home Video ever put out. Volume 1 25 July 25, 2006 This five disc box set contains the first 25 episodes from season one. Includes the featurette "Animaniacs Live! ", where Maurice LaMarche hosts an interview via satellite TV with Animaniacs voice actors, writers, and composers as they comment on the show. Volume 2 25 December 5, 2006 This five disc box set contains the second 25 episodes (26–50) from season one. Includes the featurette "The Writers Flipped, They Have No Script", where Maurice LaMarche leads a gathering of writers on what their favorite Animaniacs episodes are that they wrote. Volume 3 25 June 19, 2007 This five disc box set includes the last 15 episodes (51–65) of season one, all four episodes of season two, and the first six episodes of season three. Includes two featurettes: "They Can't Help It if They're Cute, They're Just Drawn That Way": Production commentary from the character designers, storyboard artists and art directors of the series; and "They're Totally Insane-y: In Cadence with Richard Stone": A discussion on the music of Animaniacs and a tribute to the late composer Richard Stone. Volume 4 24 February 5, 2013 This three disc box set contains the final 7 remaining episodes of season 3 (76–82) and all of season 4 (83–90) and 5 (91–99). No bonus features are included. An Animaniacs comic book, published by DC Comics, ran from 1995 to 2000 (59 regular monthly issues, plus two specials). Initially, these featured all the characters except for Pinky and the Brain, who were published in their own comic series, though cameos were possible. The Animaniacs comic series was later renamed Animaniacs! Featuring Pinky and the Brain. The Animaniacs comic series, like the show, parodied TV and comics standards, such as Pulp Fiction and The X-Files, among others. Animaniacs: Lights, Camera, Action! (2005, GBA, DS). Because Animaniacs had many songs, record labels Rhino Entertainment and Time Warner Kids produced albums featuring songs from the show. These albums include Animaniacs (1993), Yakko's World (1994), A Christmas Plotz (1995), Animaniacs Variety Pack (1995), A Hip-Opera Christmas (1997), The Animaniacs Go Hollywood (1999), The Animaniacs Wacky Universe (1999), and the compilation album, The Animaniacs Faboo! Collection (1995). In May 2017, Amblin Television and Warner Bros. Animation were in the early stages of developing a reboot of Animaniacs. The interest in the reboot was driven by a surge of popularity for the show when it was made available on Netflix in 2016, plus numerous successful projects that have revived interest in older shows, such as Fuller House. The reboot was officially announced by the streaming service Hulu in January 2018 in partnership with Spielberg and Warner Bros. Domestic Television Distribution. The reboot will consist of at least two seasons, to start airing in 2020. Yakko, Wakko, and Dot will return, along with appearances by Pinky and the Brain each episode; however, no voice actors were announced at this point. The deal includes rights for Hulu to stream all episodes of Animaniacs, Pinky & the Brain, Pinky, Elmyra and the Brain, and Tiny Toon Adventures. Spielberg will return to serve as executive producer, alongside Sam Register, president of Warner Bros. Animation and Warner Digital Series, and Amblin Television co-presidents Justin Falvey and Darryl Frank. The show will be produced by Amblin Television and Warner Bros. Animation. Hulu considers the show its first original series targeted for families. Wellesley Wild will serve as the showrunner for the series, while Carl Faruolo will serve as supervising director. Initial storyboarding work started around July 2018.
a. ^ Sources vary on the size of the Animaniacs orchestra. On the "Animaniacs Live!" featurette, host Maurice LaMarche refers to the orchestra as "35-piece". A 1995 Warner Bros. Press release refers to the orchestra as "30-piece", while an article of The New York Times reads that the orchestra was a much smaller "20-piece". In an interview for "The Cartoon Music Book", Animaniacs composer Richard Stone said that the number of people in the orchestra varied, depending on the episode and the type of music needed, but said that "I don't think we ever had more than thirty-two [pieces]". ^ a b c "Newsreel of the Stars". Animaniacs. Season 1. Episode 1. September 13, 1993. Fox Kids. ^ a b c d e f g h i j k l m n o Maurice LaMarche et al. (2006). Steven Spielberg Presents Animaniacs: Volume 1. Special Features: Animaniacs Live! (DVD). Warner Home Video. ^ a b c d e f Lenburg, p. 520. Retrieved April 29, 2007. ^ a b c d e f g h i j k l m n o p Maurice LaMarche, Tom Ruegger et al. (2006). Steven Spielberg Presents Animaniacs: Volume 2. Special Features:The Writers Flipped They Have No Script (DVD). Warner Home Video. ^ a b "Win Big". Animaniacs. Season 1. Episode 2. September 14, 1993. Fox Kids. ^ "Slappy Goes Walnuts". Animaniacs. Season 1. Episode 3. September 15, 1993. Fox Kids. ^ a b c Carugati, Anna (October 2006). "Interviews: Steven Spielberg". World Screen. WSN Inc. Archived from the original on October 11, 2007. Retrieved May 8, 2007. ^ a b Will, Ed (June 11, 1996). "Brain Power: Pinky, genius pal to resume plotting in 1997". The Denver Post. ^ a b "TV Production: What a Character! Part II of a series: The Evolution of Animaniacs". Animation Magazine. July 1995. p. 12. ^ a b c d e f g h i j Tom Ruegger et al. (2007). Steven Spielberg Presents Animaniacs: Volume 3. Special Features: They Can't Help It If They're Cute, They're Just Drawn That Way (DVD). Warner Home Video. ^ Owens, John (July 5, 1992). "Drawing On Experience". Chicago Tribune. Archived from the original on November 5, 2012. Retrieved October 1, 2011. ^ Credits from various Animaniacs episodes. ^ a b Schmuckler, Eric (April 17, 1995). "The new face in toontown. (Kids WB chief Jamie Kellner) (Special Report: Kids TV)". Mediaweek. 5 (16): 22. ^ a b c d Closs, Larry (October 28, 1995). "Spielberg Toons In: Moviemaker extraordinaire Steven Spielberg reveals he's also an animaniac at heart". TV Guide. pp. 33–36. Archived from the original on December 13, 2007. Retrieved September 8, 2007. ^ a b Strauss, Neil (October 27, 1994). "The Pop Life". The New York Times. p. 2. Archived from the original on March 5, 2016. Retrieved February 14, 2017. ^ Liebenson, Donald (March 7, 1995). "Driving You Wakko: 'Animaniacs' Bits Sound Familiar Because They Are". Chicago Tribune. USA. Archived from the original on September 29, 2012. Retrieved May 28, 2011. ^ Auty, Dan (January 10, 2018). "23 Animaniacs Gags That We Can't Believe Were Allowed On TV". GameSpot. Archived from the original on January 11, 2018. Retrieved January 10, 2018. ^ "Wakko's America". Animaniacs. Season 1. Episode 25. October 11, 1993. Fox Kids. ^ Shapiro, Craig (September 13, 1994). "Kidvid: No Case is Too Thorny for the Olsen Twins to Crack". The Virginian-Pilot. ^ Jones, Rebecca (August 27, 2000). "Rin Tin Tin Named After Finger Puppets". Rocky Mountain News. ^ a b Victor, Daniel (April 13, 2016). "The 'Animaniacs' Voices Are Reuniting. Yes, There's a New Verse to 'Yakko's World.'". The New York Times. Archived from the original on April 13, 2016. Retrieved April 13, 2016. ^ a b Gates, Annita (February 14, 1995). "TELEVISION; Hey, It's Not Sondheim, but Adults Don't Care". The New York Times. Archived from the original on April 24, 2016. Retrieved February 14, 2017. ^ a b O'Dell, Ron. "Warner Bros. Animation Chronology: 1994". The Warner Bros. Animation Archive. Toon Zone. Archived from the original on August 29, 2007. Retrieved May 12, 2007. ^ Mendoza, N.F. (December 26, 1993). "Shows for Youngsters and Their Parent Too : A sense of history and smarts set Fox's 'Animaniacs' apart". The Los Angeles Times. Archived from the original on October 15, 2012. Retrieved October 1, 2011. ^ a b Kent, Milton (January 30, 1994). "Warner Bros. is whistling a happy toon: New characters have attitude and an audience". The Baltimore Sun. ^ a b Freeman, Michael (1994). "Fox Children's Network's. ('Mighty Morphin Power Rangers' viewer ratings) (Syndication) (Brief Article)". Mediaweek. 4 (38): 6. ISSN 1055-176X. ^ Mangan, Jennifer (December 21, 1993). "'Animaniacs' Stars Can Make Even A Parent Laugh". Chicago Tribune. USA. Archived from the original on September 29, 2012. Retrieved May 28, 2011. ^ a b "Avid "Animaniacs" Fans make Pilgrimage to Warner Bros. Studio" (Press release). Warner Bros. August 9, 1995. Archived from the original on June 30, 2007. Retrieved May 11, 2007. ^ "The Peabody Awards: Animaniacs (1993)". Archived from the original on June 11, 2010. Retrieved May 19, 2007. ^ "Legacy: 22nd Annual Annie Award Nominees and Winners (1994)". Annie Award Database. Archived from the original on January 2, 2015. Retrieved January 31, 2015. ^ "Legacy: 23rd Annual Annie Award Nominees and Winners (1995)". Annie Award Database. Archived from the original on January 2, 2013. Retrieved January 31, 2015. ^ O'Dell, Ron. "Warner Bros. Animation Chronology: 1996". The Warner Bros. Animation Archive. Toon Zone. Archived from the original on June 27, 2007. Retrieved May 19, 2007. ^ "Legacy: 25th Annual Annie Award Nominees and Winners (1997)". Annie Award Database. Archived from the original on December 30, 2015. Retrieved January 31, 2015. ^ O'Dell, Ron. "Warner Bros. Animation Chronology: 1997". The Warner Bros. Animation Archive. Toon Zone. Archived from the original on June 29, 2007. Retrieved May 19, 2007. ^ "Legacy: 26th Annual Annie Award Nominees and Winners (1998)". Annie Award Database. Archived from the original on June 3, 2017. Retrieved January 31, 2015. ^ a b O'Dell, Ron. "Warner Bros. Animation Chronology: 1998". The Warner Bros. Animation Archive. Toon Zone. Archived from the original on June 30, 2007. Retrieved May 19, 2007. ^ O'Dell, Ron. "Warner Bros. Animation Chronology: 1999". The Warner Bros. Animation Archive. Toon Zone. Archived from the original on July 1, 2007. Retrieved May 19, 2007. ^ "Warner Bros. Television Animation Wins More Emmy Awards Than Any Other Animation Studio; Three Additional Emmys Won Saturday May 15, Twenty-Five in Total" (Press release). Warner Bros. May 17, 1999. Archived from the original on September 29, 2007. Retrieved May 19, 2007. ^ "Top 100 Animated TV Series". IGN. January 14, 2009. Archived from the original on February 8, 2015. Retrieved January 31, 2015. ^ "TV Guide Magazine's 60 Greatest Cartoons of All Time". TV Guide. September 24, 2013. Archived from the original on July 10, 2018. Retrieved September 5, 2015. ^ Solomon, Charles (September 13, 1993). "TV REVIEWS : 'Pink Panther,' 'Animaniacs' Debut". The Los Angeles Times. USA. Archived from the original on October 15, 2012. Retrieved October 1, 2011. ^ a b c d e f g h Weinman, Jamie (August 2002). "When did the Warner siblings jump the shark? A look at the life of Animaniacs". The WBAA Presents Voice. Toon Zone. Archived from the original on May 1, 2007. Retrieved April 30, 2007. ^ a b Lenburg, p. 51. Retrieved April 29, 2007. ^ Trusdell, Brian (May 28, 1995). "Focus : Warner's Toon Factory for the '90s". The Los Angeles Times. USA. Archived from the original on October 14, 2012. Retrieved May 10, 2011. ^ Mendoza, N.F. (October 22, 1995). "WB Raises the Animation Ante". Los Angeles Times. Archived from the original on October 15, 2012. Retrieved March 23, 2011. ^ Lupercal. "Animaniacs". Keyframe. Archived from the original on November 30, 2006. Retrieved April 15, 2007. ^ a b c "Kids WB! announces fall lineup". AWN.com. AWN, Inc. March 12, 1999. Archived from the original on May 10, 2011. Retrieved April 30, 2007. The results of Warner Bros. TV Animation's massive 100+ artist layoff ... are clearly obvious this season. The studio is not currently producing any new episodes of Histeria!, Pinky, Elmyra & The Brain, Sylvester & Tweety Mysteries or Animaniacs. ^ a b "Multilayered Humor: 'Animaniacs' Serves Up Laughs For All Age Groups". Chicago Tribune. December 23, 1999. Archived from the original on November 7, 2012. Retrieved September 6, 2015. ^ Loveridge, Lynzee (April 13, 2016). "Animaniacs, Freakazoid Producer Credits Pokémon For WB Cartoon Decline". AnimeNewsNetwork. Archived from the original on April 16, 2016. Retrieved April 17, 2016. ^ John Dempsey (August 30, 2000). "Toon web sans synergy: WB sells to Nick: Cartoon Network turns down Spielberg-produced skeins". Variety. Archived from the original on August 22, 2007. Retrieved April 30, 2007. ^ "Acquires Exclusive Television Rights to Warner Bros. Animation's Steven Spielberg presents Pinky & The Brain" (Press release). Warner Bros. August 29, 2000. Archived from the original on September 27, 2007. Retrieved June 8, 2007. ^ Amanda Kondolojy (December 3, 2012). "Full Roster of Holiday Programming on The Hub Highlighted by 'Animaniacs' Network Debut + 'My Little Pony', 'Pound Puppies' & 'Transformers: Rescue Bots' Specials". TV by the Numbers. Archived from the original on December 10, 2012. Retrieved December 20, 2012. ^ Liebenson, Donald (December 23, 1999). "'Animaniacs' Serves Up Laughs For All Age Groups". Chicago Tribune. Archived from the original on November 7, 2012. Retrieved October 1, 2011. ^ "Toon Zone News Archives: February 1999". Toon Zone News. Toon Zone. February 18, 1999. Archived from the original on July 24, 2008. Retrieved May 11, 2007. ^ a b Lambert, David (November 10, 2005). "How Long Before Animaniacs Escape the Water Tower?". TVShowsonDVD.com. Archived from the original on October 12, 2007. Retrieved March 26, 2007. ^ ""Animaniacs" Vol. 2 on DVD: Wakkorotti and WHV Belch Out Another Great Set". Toon Zone. December 3, 2006. Archived from the original on March 11, 2016. Retrieved May 24, 2007. ^ Lacey, Gord (August 16, 2006). "Time to go Wakko (again)-Volume 2 News!". TVShowsonDVD.com. Archived from the original on October 12, 2007. Retrieved March 26, 2007. ^ Lacey, Gord (February 28, 2007). "Slappy the Squirrel joins the Warners on Volume 3". TVShowsonDVD.com. Archived from the original on October 12, 2007. Retrieved March 26, 2007. ^ Lambert, David (October 16, 2012). "Animaniacs – Who's Broken Loose From the Tower? Those Zany-to-the-Max Siblings Finally Get Volume 4 DVDs!". TVShowsonDVD.com. Archived from the original on December 19, 2012. Retrieved December 20, 2012. ^ "Toon Zone – Comics – Animaniacs". Toon Zone Comics. Toon Zone. Archived from the original on August 15, 2009. Retrieved April 11, 2010. ^ "Animaniacs". GameRankings. CBS Interactive, Inc. Archived from the original on September 9, 2009. Retrieved April 15, 2010. ^ "Animaniacs". GameRankings. CBS Interactive, Inc. Archived from the original on August 13, 2010. Retrieved April 15, 2010. ^ "Animaniacs". GameRankings. CBS Interactive, Inc. Archived from the original on August 14, 2009. Retrieved April 15, 2010. ^ "Animaniacs Game Pack". GameRankings. CBS Interactive, Inc. Archived from the original on June 5, 2011. Retrieved April 15, 2010. ^ "Pinky and the Brain: World Conquest". GameRankings. CBS Interactive, Inc. Archived from the original on June 5, 2011. Retrieved April 15, 2010. ^ "Animaniacs Ten Pin Alley". GameRankings. CBS Interactive, Inc. Archived from the original on August 24, 2009. Retrieved April 15, 2010. ^ "Animaniacs: A Gigantic Adventure". GameRankings. CBS Interactive, Inc. Archived from the original on June 5, 2011. Retrieved April 15, 2010. ^ "Animaniacs Splat Ball". GameRankings. CBS Interactive, Inc. Archived from the original on June 5, 2011. Retrieved April 15, 2010. ^ "Pinky and the Brain: The Master Plan". GameRankings. CBS Interactive, Inc. Archived from the original on June 5, 2011. Retrieved April 15, 2010. ^ "Animaniacs: The Great Edgar Hunt". GameRankings. CBS Interactive, Inc. Archived from the original on November 30, 2009. Retrieved April 15, 2010. ^ "Animaniacs: The Great Edgar Hunt". GameRankings. CBS Interactive, Inc. Archived from the original on December 4, 2009. Retrieved April 15, 2010. ^ "Animaniacs: Lights, Camera, Action!". GameRankings. CBS Interactive, Inc. Archived from the original on August 19, 2009. Retrieved April 15, 2010. ^ "Animaniacs: Lights, Camera, Action!". GameRankings. CBS Interactive, Inc. Archived from the original on April 13, 2010. Retrieved April 15, 2010. ^ "Animaniacs Discography: Main Albums". Allmusic. Rovi Corporation. Retrieved April 9, 2010. ^ Boldman, Gina. "Faboo! Collection: Review". Allmusic. Rovi Corporation. Retrieved April 9, 2010. ^ Schneider, Michael (May 30, 2017). "'Animaniacs' Reboot Being Developed By Steven Spielberg, Amblin TV and Warner Bros. — Exclusive". IndieWire. Archived from the original on May 30, 2017. Retrieved May 30, 2017. ^ Alexander, Julia (January 4, 2018). "Hulu is rebooting Animaniacs, will premiere in 2020". Polygon. Archived from the original on January 5, 2018. Retrieved January 4, 2018. ^ Otterson, Joe (January 4, 2018). "'Animaniacs' Reboot Lands Two-Season Straight-to-Series Order at Hulu". Variety. Archived from the original on January 4, 2018. Retrieved January 4, 2018. ^ Goldberg, Leslie (January 4, 2018). "'Animaniacs' Revived at Hulu With 2-Season Order". The Hollywood Reporter. Archived from the original on January 5, 2018. Retrieved January 4, 2018. ^ Andreeva, Nellie (January 22, 2018). "'Animaniacs': Wellesley Wild Set As Showrunner Of Series Reboot At Hulu". Deadline Hollywood. Archived from the original on January 23, 2018. Retrieved January 23, 2018. ^ Ko, Ricker (April 24, 2018). "Nick Made A Funny Mini-Series. Then They Sat On It For Years: Whatever Happened To 'Bug Salad'?". Cartoon Brew. Archived from the original on May 25, 2018. Retrieved May 24, 2018. ^ Bishop, Rollin (July 12, 2018). "'Animaniacs' Reboot Storyboard Artist Shares Yakko, Wakko, and Dot Sketch". Comicbook.com. Archived from the original on July 12, 2018. Retrieved July 13, 2018. Lenburg, Jeff (1999). "Animaniacs [Theatrical Short]". The Encyclopedia of Animated Cartoons (Second ed.). New York, New York: Checkmark Books. p. 51. ISBN 0-8160-3831-7. Lenburg, Jeff (1999). "Steven Spielberg Presents Animaniacs [Television Series]". The Encyclopedia of Animated Cartoons (Second ed.). New York, New York: Checkmark Books. p. 520. ISBN 0-8160-3831-7. Goldmark, Daniel; Taylor, Yuval (2002). The Cartoon Music Book. Chicago: Chicago Review Press. ISBN 978-1-55652-473-8. Sandler, Kevin (1998). Reading the Rabbit: Explorations in Warner Bros. Animation. New Brunswick, New Jersey: Rutgers University Press. ISBN 0-8135-2538-1. Animaniacs at Don Markstein's Toonopedia. Archived from the original on April 4, 2012.